There’s no rest for the weary. Though the suitably roomy L-shaped sofa has arrived, Gadora is still searching for extra seating for the 2nd Floor Lounge. I’m hoping it will be the place-to-be after all, so we’ll want enough space for the work peeps to enjoy it, thoroughly. In search of both a “floating” wall shelf and carved wooden stumps, last week I visited the folks at Delta Millworks, who recommended I meet Lee of Old Texas Floors (there’s a visual story here! but you’ll have to wait for it). Lee’s worked up a pricey quote for 2 stumps-to-turn-stools and to be sure…I surfed the interwebs for comparable items. Turns out Lee’s wood stools—which were once beams anchoring an old warehouse—will be aaaah-mazing and at more than 100 years old, they are priced just right. While nurturing a cup o’ joe this morning, Gadora found a few items worth percolating over: home furnishings made from reclaimed coffee sacks. This hand-built chair inspired by Mies van der Rohe’s iconic Barcelona, is an upholstered version of a Mexican butaca. 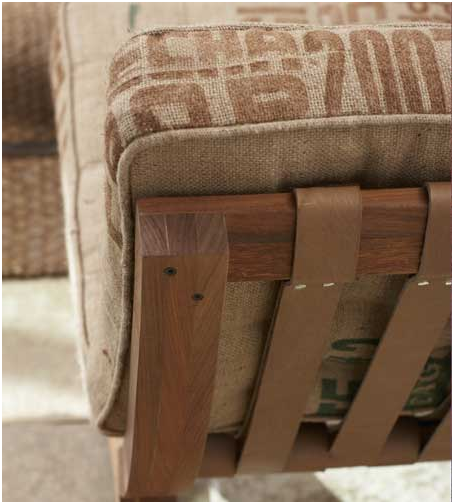 They’re made of machiche, a tropical Guatemalan hardwood, with well-padded cushions upholstered in reclaimed jute coffee sacks. I. Want. Two. Have since learned these “upcycled” ottomans are offered wholesale only (see my sad face? ), but you’ll find them, along with a wealth of other dreamy goodies, at ABC Carpet & Home in NYC. The jute bags make a whimsical screen-print over the Canadian-produced bench innards. Found them at Gus*. Upcycled Ottoman, on the go. This L.A. home owner was featured on Apartment Therapy with a covered piano stool in a printed-jute coffee sack. Me thinks it livened up the space! These chairs at Café Direct are no doubt covered in coffee. Bags, that is. Some creative thinker (Victor) reworked several miss-matched chairs into a cohesive look simply by painting them all matte black, and covering them in similar colored bags. Their photo journal on Flickr. Kirk Kempker Jrs tire ottomans. The pièce de résistance, and highly caffeinated, is fix_pdx’s pair of “forlorn wing chairs” found at Black Butte Ranch in Portland, OR. Fix studio partners Jen Jako and Chris Bleiler “recharged” a pair of vintage chairs with reclaimed coffee bags. Um, brilliant. Check out the ottomans made of jute furniture webbing. Um, brilliant-er! Pair of vintage wingback chairs. Love. 7Gadgets ~ A big arse bean bag chair for pure enjoyment. Coffeebags.com ~ Get your own sack and make something grand. ezonearticles.com ~ 10 rather snappy uses for coffee bags. ShelterPop ~ VivaTerra’s butaca chair, with ottoman. Nice! Posted on August 17, 2010 November 7, 2012 by gadorawilderPosted in MusingsTagged Apartment Therapy, Architecture, coffee bags, Coffee Table, Do-it-Yourself, easy art project, homemade craft, inexpensive project, Shabby Chic, vintage, VivaTerra. What an interesting post…who knew coffee sacks even existed?! Love the ideas.